Before re-designing your business cards, check this out. It will save you hours and money for trials and errors, in looking for a practical and simple way to make business cards useful for your mentalism effects. Clever business cards can become a very powerful secret weapon you will always carry with you. They can also replace expensive props or effects, and allow you to create your own and personalized routines. Not to mention that your business cards are a wonderful marketing tool, as well. 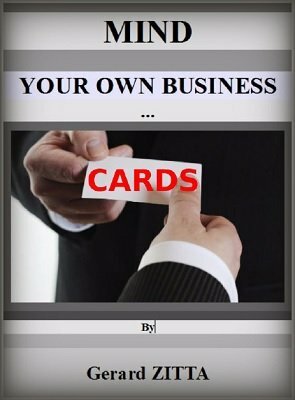 The "system" described in this e-book, will allow you to improvise many mental effects, that use two to seven, or eight business cards, but you can adapt it to more, if needed. Another important aspect is that it can be used also as a "safety check" for your existing effects, or as a way to secretly gain some information, or force it. This "system" is also flexible, and can be modified, or adapted to your own design. Of course, you will have to print your own business cards, or have them printed. with two business cards: "YES/NO trick" with NO gimmicks, and hands-off. With three business cards: "Monty Hall"
With four business cards: "Roads to hell"
With five business cards: "ESP"
With three or more participants: "Graphology"